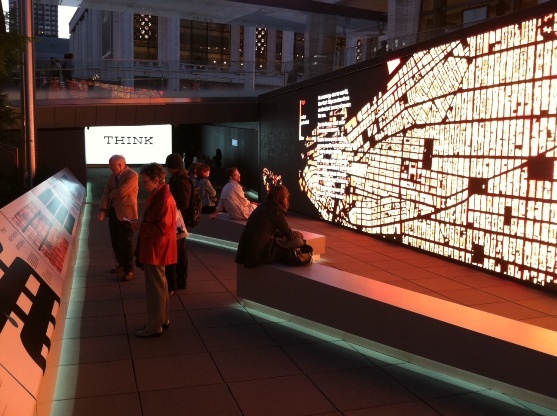 …which is part of a bigger project, the THINK exhibition taking place at Lincoln Center, NYC, marking IBM’s 100th anniversary and its contribution to the technical advances of the last century. What is special about this wall, is that it shows live data from its surroundings in real time : Broadway traffic, air quality or solar energy turning the natural world it into sparkling data points. …how society became more effective through science and technology. 40- seven foot screens present a 12 minutes long caleidoscop of images and sounds narrating stories of the past and present. Visuals of falling grains of rice explain how scientists, using IBM technology, attempt to make more resilient crops; the image of a typewriter and of a rocket portray the trajectory of technical advancement of the 20th century. 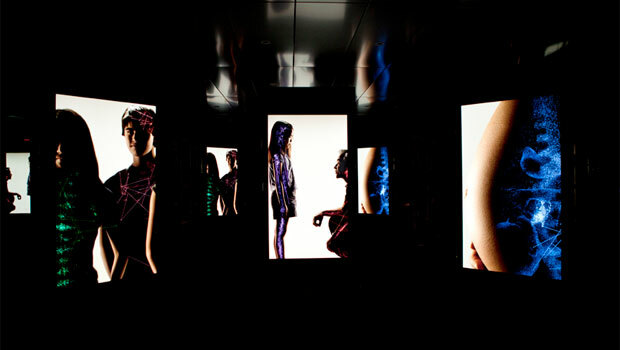 ”This is the pattern of progress…” the film concludes and the 40 displays turn into touchscreens resembling a giant smartphone. The viewers are encouraged to interact with the screens to learn more about inspiring scientific advancements and initiatives such as: weather prediction algorithms, virus spreading simulations or data tracking & visualisation methods. They can also leave comments and read what others think about what they’ve just seen and heard. The exhibit is an example of how the digital can be used to attract, inform and inspire and take the viewers on a journey of discovery, during which they are not to remain passive but are encouraged to play an active role. Sources: DDB Paris, IBM and West Side Rag. Hi Lynne! Many thanks for your enquiry. You can click on the RSS button below (under the purple Free Trial CTA). Or else you can send me an email at info@digitalsignage.net and I will add you to our subscribers list.